The family who studies together stays together. The Lafond family of Chicago, Ill., took family togetherness to a new level May 12, as William “Bill” Lafond ‘85, M’18, and his two children, Patrick Lafond ’12, M’18 and Lauren (Lafond) Moderson M’18, all received M.B.A. degrees at Saint Mary’s Winona Campus commencement ceremony after completing the online program. 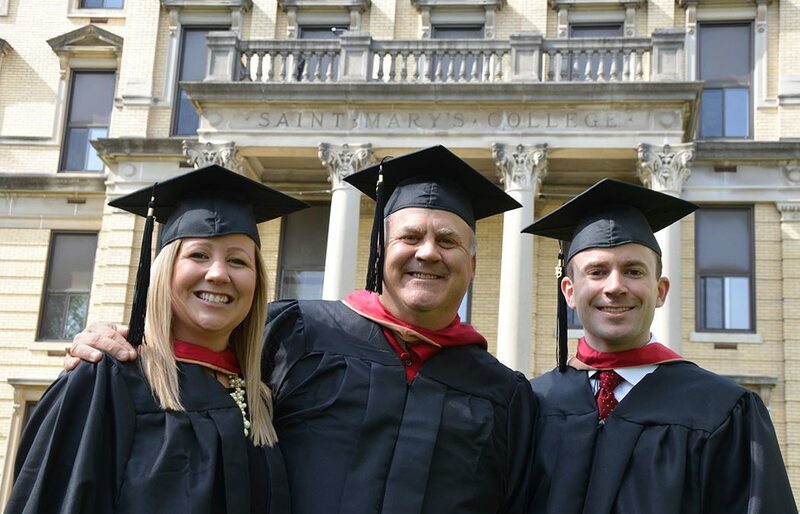 “Graduating with my family is a life highlight,” said Bill, who graduated from Saint Mary’s — the first time — with his wife, Melissa (Kunert) Lafond ’85. His sister Therese (Lafond) Pawlicki ’88 is also a Saint Mary’s alumna. Competition was fierce among the three, although all in good fun. “The phones lit up when grades were posted,” said Bill. On top of competing with her brother and dad for the best grades, Lauren had her plate full in completing her degree with a toddler at home, working full time as a senior financial analyst, moving to a new home, and welcoming her second daughter in January. She said the online structure was helpful because she didn’t have to physically leave her family at a predetermined time or day of the week. She was able to do coursework on her own time, either before work or after her daughter went to bed. Patrick is hopeful his M.B.A. degree will help him grow in his risk management career and is grateful for his six years of Saint Mary’s education.